We’re real people with real families and a real desire to deliver the best possible dental experience and treatment for our patients in the greater Springfield area. To that end, each team member engages the latest innovations in dental treatment, techniques, and technology to ensure our patients receive the most advanced treatment available. 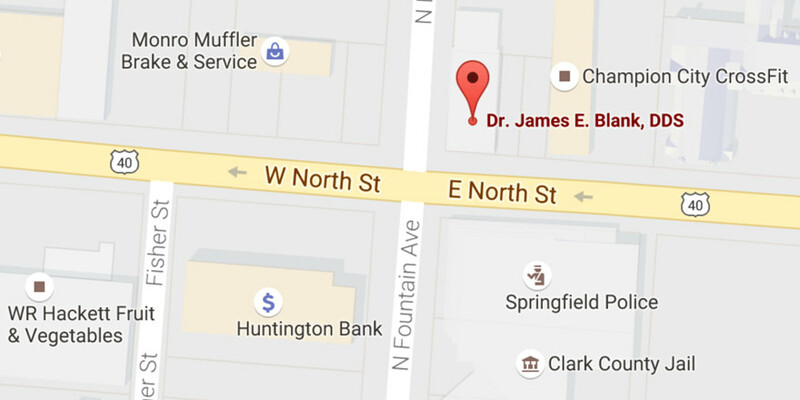 With a passion for delivering world-class dental care, Dr. James (Jim) Blank works diligently to remain on the leading edge of modern dentistry. He has completed advanced training in sleep medicine and TMJ therapy, dental implant surgery and restoration, prosthodontics, occlusion, cosmetic dentistry, dental materials, and dental technology. Along with continuing to grow his knowledge far beyond the required hours, Dr. Blank enjoys sharing with dental and medical professionals by teaching and lecturing to study clubs and groups throughout the United States. As a faculty dentist and lecturer for The Metz Center for Sleep Apnea, Dr. Blank shares his experience and insights on topics such as sleep medicine, TMD, and practice management. He has also lectured to the prestigious American Academy of Restorative Dentistry, made of a the world's leading dental practitioners and researchers. After receiving his undergraduate degree from Ohio Northern University, Dr. Blank earned his Doctor of Dental Surgery from The Ohio State University College of Dentistry in 2004. He is a small business owner of multiple career related companies and in 2016 received special recognition by the Dayton Business Journal as one of 40 top business leaders under the age of 40. Dr. Blank is a cofounder of the Columbus Interdisciplinary Dental Study Club and a member of: American Thoracic Society, Academy of Dental Sleep Medicine, American Dental Association, American Academy of Cosmetic Dentistry, Academy of General Dentistry, American Academy of Implant Dentistry, International Congress of Oral Implantologists, International Team for Implantology, and the Sfumato Study Club.